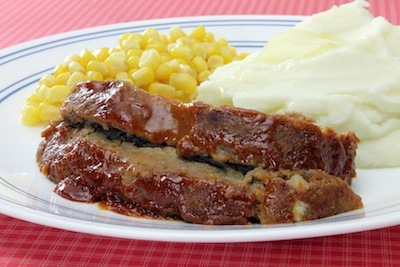 These easy meatloaf recipes are great for kid friendly dinners. I have several different shapes of mini pans that work great for meat loaf. The kids love them! However you can use normal loaf pans or shape into a loaf and place on a tin foil lined cookie sheet. Meat loaf is a great make ahead meal. You can make this in the morning and just pop in the oven at dinnertime. Meat loaf also freezes really well. 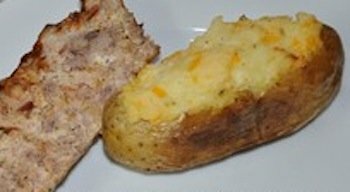 You can add pureed vegetables in your meatloaf easily for more nutrition. You can also turn any of these easy meatloaf recipes into meatballs. Place all ingredients together in bowl and using your hands, combine together. In a loaf pan, layer a sheet of tin foil with excess over the edges. 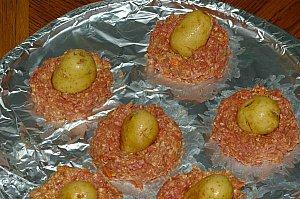 Form meat into loaves and place in pan on top of tin foil. Fold edges over and wrap again with tin foil if desired. Continue with all meat. Freeze. When ready place meatloaf from freezer to oven and bake 1 hour -1 1/2 hours. In bowl combine egg, crackers, 4 Tablespoons shredded cheese, chopped onion, garlic, bacon, salt and pepper. Add beef into mixture and combine. Shape into loaf and freeze wrapped in tin foil or in a ziploc bag. When ready to cook take out of the freezer and place in a loaf pan. Top with more bacon pieces if desired. Bake at 350 degrees for 30minutes- 1 hour. Test with a meat thermometer. In mixing bowl, combine all ingredients together. Massage together with your fingers or spoon. Shape into meatloaves or meatballs. Top with additional sauce, if desired. For extra kids fun, cook meatloaf for 30 minutes then top with shredded mozzarella cheese and pepperoni. Continue to bake until meat is cooked through. In a large mix together ground meat, eggs, bread crumbs and cheddar cheese. Crumble bacon into bowl and add garlic, salt and pepper. Blend together until well combined. Place in two loaf pans. Spread barbecue sauce over the top. Freeze one for another day and bake one at 35-45 minutes. Meatloaf ready to cook. I added the sauce before baking and it turned out well. Mix all items in a large bowl until well mixed. Split and put into two loaf pans or one cake pan depending on what size and shape you want your pieces of meat to be. Bake at 400 degrees until meat is almost done. (not pink in middle) remove from oven, drain any grease and put topping on then place back in oven for 10 minutes. Mix all items together. Spread over meat and return to oven. The topping should be thick look grainy and have a sweet and tangy taste. Please note that the consistency and taste of the ketchup and BBQ sauce may alter the taste of the topping. If your topping is to thick add equal parts of ketchup and honey/molle till you can spread it over meat. If your topping is to sweet add mustard to taste, if to tangy add more sugar or grape jelly to taste. Mix all ingredients together and bake as a loaf or make small meat balls. Bake until meat is coked through. Yum! We make it a candlelight dinner with salad and rolls. Bake in a oven at 350 degrees F. until the top is golden brown and the internal temperature is 160 degrees F.
Grease loaf pan or mini loaf pans with shortening or cooking spray. Shape meatloaf into the pan. Bake at 350 degrees for 15-20 minutes and test with a meat thermometer. **If you have mini loaf pans or mini cake pans they work great for meatloaf also. If you dont have these available use a muffin pan. 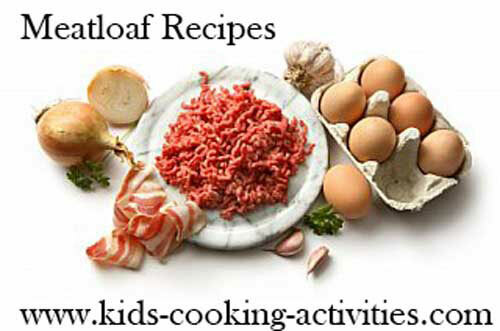 Kids can mix and mash the meatloaf together. 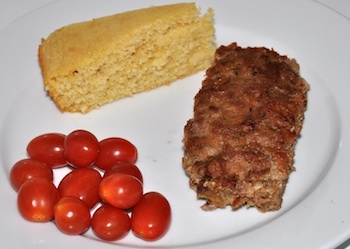 Mini meatloaf dinner with cornbread. A fun idea that you can use any easy meatloaf recipes to create. In a mixing bowl add hamburger, egg, oatmeal, salt and Worcestershire sauce. In blender puree celery and carrot. Add to hamburger mixture. Mix together until well blended. On a cookie sheet form hamburger mixture into small rings like below. Bake for 30-45 minutes or until meat is done and potatoes are tender. Poke a potato with a fork and if it goes through they are done. 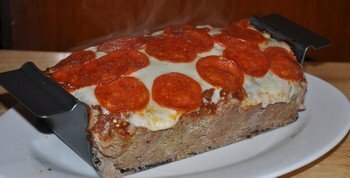 Share your favorite easy meatloaf recipes.